If a company’s bunker spoons for striped bass fishing become popular, the spoons must be doing something right. Spoon Fed’s bunker spoons swim especially well in different seas and at different speeds. That’s what anglers are saying, Hank Brucker from the company says. If you search around the internet, that seems true. This angler who posted on the New Jersey website the Bass Barn wrote something like that. The spoons swam with especially consistent action in different seas, winds and depths, and in different paths the boat was sailed, like sailing straight or in a turn, that angler wrote, for instance. If you’re reading what he posted, you’ll also see how serious some anglers are about trolling for stripers with bunker spoons. That's why if a bunker spoon becomes popular, the spoon must be doing something right. That angler also wrote about the quality of the spoons. Spoon Feds, made from stainless steel, feature powder-coated painting to resist chipping. The company says this is high-quality stainless steel, and you might be prone to believe that, because of who the company is. The parent company, more than 100 years old, is a fourth-generation one that forms metal parts mostly for the defense and aerospace industries. This is a New Jersey company, Hank from Spoon Fed noted. The anglers who posted on that Bass Barn thread noted that, too. The company is headquartered in Liberty Corner. Spoon Fed bunker spoons are also available in a variety of colors, including two-tone colors, Hank also noted. Many spoons from other companies are only available in green or white, he said. So, Spoon Feds have become popular. You know what I say about that. 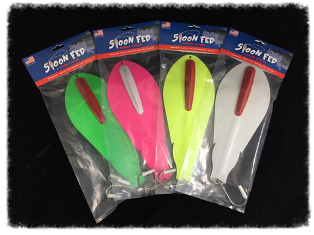 For more info, visit the Spoon Fed Lures website.